The MPF24 is a laboratory tool for product development. It is used to try out new ideas, assess ingredients, provide test marketing samples, and even make small production batches of product with high-value ingredients. It does so without loss of production time - scale up is accurate thanks to comparable geometry. The machine can be stopped and the clam-shell barrel opened at any time to note the state of processing, allowing screw and heat transfer profiles to be optimised. 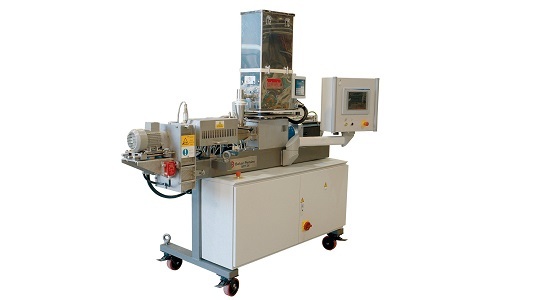 The machine is mobile; available with a full selection of cutters and dies; and sophisticated controls include data capture, trending, and recipe management.